Writing a purchase request for a shredder? Protect yourself with good specifications. Over the decades, my fellow account managers and I have seen endless thousands of shredder quote requests. We’ve seen great ones and we’ve seen awful ones. Sometimes we are blown away by book length RFQs written for just a small office unit. Overkill, maybe. The really sad situations are the ones where we see folks end up with lemons. Those bad results often come from RFQs that are too short and simple. We could see the storm clouds early on. More so than ever, we see RFQs for major shredder purchases, with nothing, or almost nothing, specifying the minimum technical requirements. I know many customers who worked and waited over moths or even years to put together approvals, research, and funding for a shredder purchase, only to get stuck in the end with equipment that doesn’t match up to what they requested or needed. Ouch! So, how do you specify a shredder on a purchase request and RFQ in order to avoid getting a clunker? NSA approval – if you need the machine to destroy classified materials, put this in. NSA official throughput – sadly, shredder vendors can be loose with their own ratings (sheets per feed, in particular), so specify an official NSA reported throughput rating. These ratings are listed in reams of paper per hour, as tested by the NSA, so can’t be fudged. The ratings can be found with the Evaluated Products Lists on the NSA’s Media Destruction Guidance Web Site. Throat width – if you have lots of wide materials, then specify a wide throat, otherwise 9.5” to 10.25” width is plenty for standard office paper. Control features – if the machine you prefer has better quality controls, like hard switches or touch screen, include that specification, to eliminate machines with flimsy touch pads. 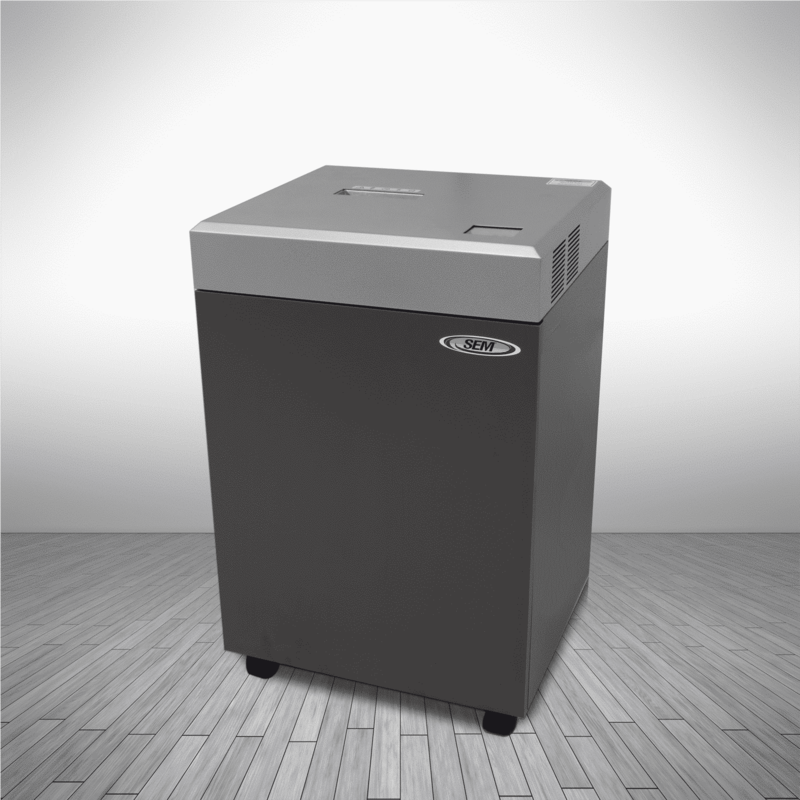 Cabinet type – most shredder cabinets are made of pressboard, but some have metal tops or metal bodies overall. Cutting head type – this is especially important if you’ve selected a machine with a “no- oil” or swappable cutting head. Local service availability – not all shredder vendors have local service in every region. Others will rely on office supply stores who only work on shredders one in a rare while. It is best to specify the type of support you want for local service. to change…no fuss/ no mess. For a short video on how easy it is click here. won’t be features on the machine that gets purchased. BUT, there is one more thing. You need to press for the specifications to end up in the advertized RFQ. Many procurement offices write RFQs in the loosest possible way, for example: “Acme Jet Pack Model XYZ, or equal” with no technical specifications whatsoever. Or they might use specifications that are so loose that someone could bid an Estes model rocket engine with a roll of duct tape and a “good luck” note, and be within the RFQ requirements. No tech specs means pretty much anything goes. Frequently our customer report being pressed to accept the lowest priced offer that comes in, based on LPTA evaluation guidelines. With no technical specifications to fall back on, it is hard to resist that pressure. SEM’s advice is to do your research, find what you really need as minimum specifications and features, and get those specs into the RFQ. Happy shopping!